Seriously, though, what damsel in distress wouldn't want an emergency tool at their disposal? This little Squirt packs in quite a few necessity tools into one small package, great for clipping on a key chain or carrying around in your purse since it only measures 2.25 inches when closed. It comes with eleven different tools: a plain-edge knife, needle-nose pliers, wire cutters, single-cut file, cross-cut file, can/bottle opener, tiny screwdriver, flat-head screwdriver, Phillips screwdriver, awl, and a lanyard attachment too. Each tool is made from pure stainless steel, as well as the internal body of the case and handle. The pink handles are made from anodized aluminum, making them lightweight and impervious to damage from the natural elements. And as with all Leatherman tools, it's backed by a lengthy 25-year warranty. 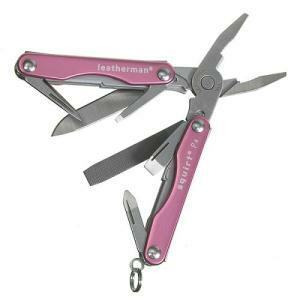 This pink Leatherman would make a great gift for your sister, wife, or any lady in your life that you wish to protect. You'll know they'll be a little more prepared for an unexpected situation with this Squirt P4 at their disposal, especially since Leatherman's history of durable multi-tools has been proven time and time again.